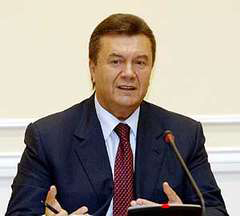 Opposition leader Viktor Yanukovych is leading with 36.86% in the Ukrainian presidential elections, after half of the ballots has been counted, the country's Central Election Commission said on Monday, FOCUS News Agency reported according to RIA Novosti. Prime Minister Yulia Tymoshenko trails with 24.31%. Ex-National Bank head Serhiy Tyhypko is third, with 13.08% of the vote, while ex-parliament speaker Arseniy Yatsenyuk has gained 6.8% and the country's incumbent President Viktor Yushchenko 4.87%. The elections took part in the ex-Soviet state on Sunday. Yanukovych and Tymoshenko are likely to face each other in a runoff as none of the candidates is gaining 50% plus one vote needed to win the elections in the first round.